Shoojit Sircar’s much anticipated film October, a Rising Sun Films’ production will now release on 13th April, 2018. The film, a slice of life love story written by Juhi Chaturvedi and directed by Shoojit Sircar will star Varun Dhawan in the lead. The film is currently on floors. With a repertoire of films like Yahaan, Vicky Donor, Madras Cafe, Piku and Pink that have explored different genres and have won accolades including National Awards, Rising Sun Films’ new venture, October, will be a story about love. “It is a genre that I have always wanted to delve in. While love and romance have been entwined with Indian cinema, there is abundance in that emotion that everyone can have their own interpretations of. Juhi and I have always tried to create stories from the reflections of real life moments that we see around us. 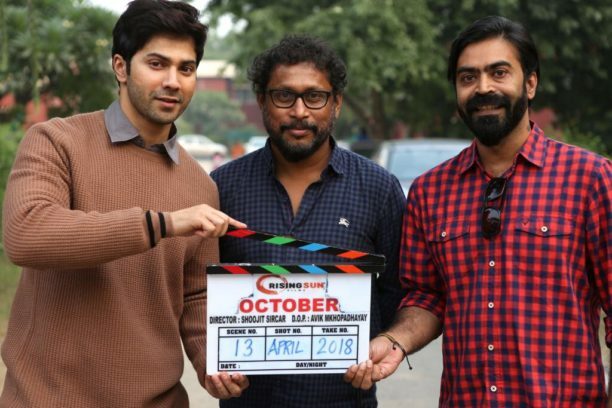 October is another effort to explore those moments out of simple situations of life,” shared Shoojit in an earlier statement. And there is more in store for the audience! Toasting their previous successes (Vicky Donor, Piku), Shoojit Sircar will be once again collaborating with Juhi Chaturvedi for October, making it all the more exciting, “Our stories come from day today intricacies & complexities of life…the effort is always to find insightful and charming nuances in what seems the obvious. With Shoojit’s innate ability to steer the story in a way that creates poignant and compelling moments out of simple situations of life, I am hoping this time too we create something people find a connect with and make their own,” expressed Juhi. Rising Sun Films have the penchant for conscientiously adhering to the everyday life, adorning it with moments that remain etched in the hearts of their audience. With October the blazing baton moves forward. 16 queries in 0.340 seconds.